500 alpha tagging. VHF low/high. UHF. Civilian & military air bands. Close Call RF Capture technology. Do Not Disturb mode prevents close call checks during transmission. PC programming port. Includes USB cable, batteries & antenna. Listen in and stay informed with the Uniden BC125AT Compact Bearcat Handheld Scanner. This sophisticated scanner with 500 alpha-tagged channels boasts a convenient compact design and loads of features. Close Call RF capture technology instantly tunes to signals from nearby transmitters, and the Do Not Disturb Mode prevents Close Call checks during a transmission. 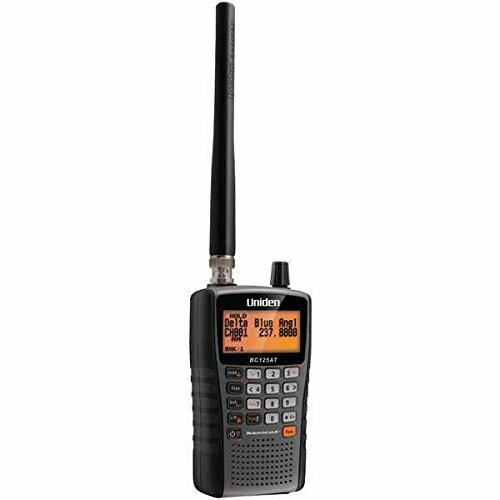 With this Bearcat scanner, you can listen to military and civilian air bands as well as important weather and safety alerts.